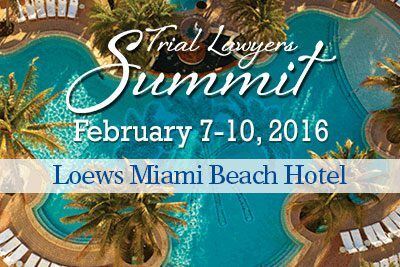 Attorney Michael Waddington lectures at the prestigious 2016 National Trial Lawyers Summit, held at the Loews Miami Beach. His lecture is based on his best selling book, The Art of Trial Warfare: Winning at Trial Using Sun Tzu’s The Art of War. Additional speakers include: Mark Geragos, Gloria Allred, William H. “Billy” Murphy, Bobby Lee Cook, Mark O’Mara, Alan Dershowitz, Jose Baez, and others. 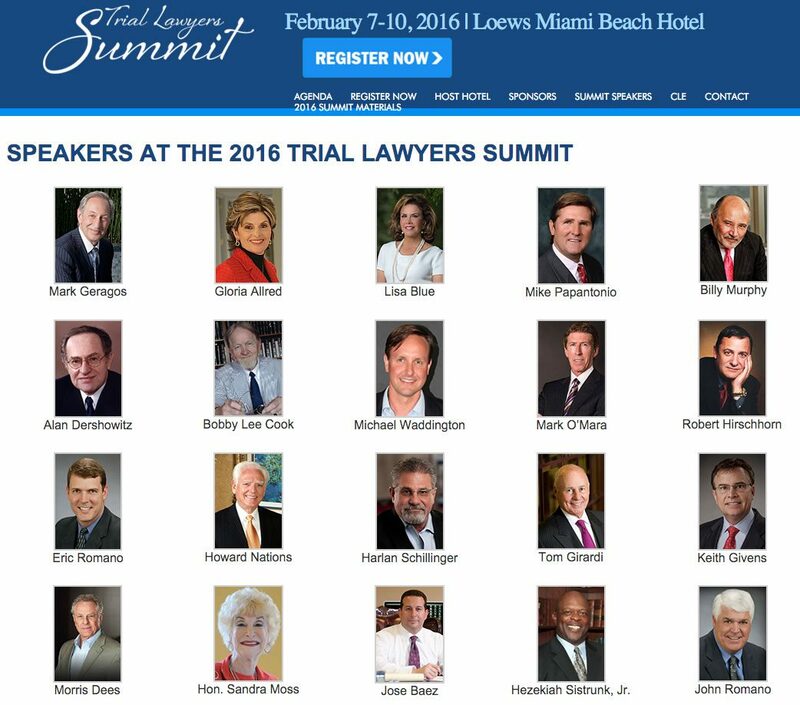 The Trial Lawyers Summit, sponsored by The National Trial Lawyers, is the ultimate trial advocacy conference taught by an all-star team of trial lawyers. It is like no other legal conference, ever. 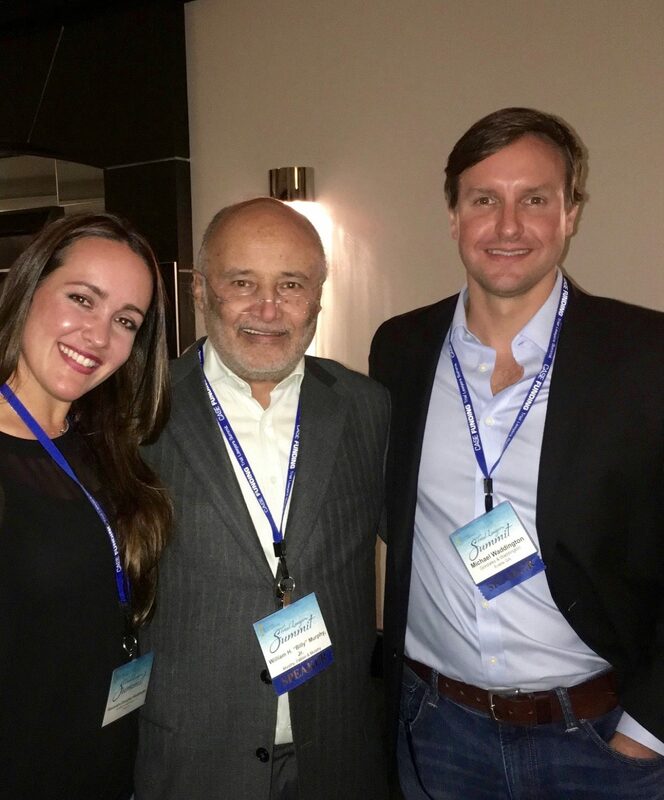 Michael & Alexandra with legendary attorney William “Billy” Murphy, Jr., a fellow guest speaker at the 2016 Trial Lawyers Summit. Outstanding networking opportunities started with a Super Bowl 50 Kick-Off Party, continuing with keynote speaker NFL legend Terry Bradshaw at The Trial Lawyer Awards & Recognition Luncheon, followed by the President’s Reception with live music by four-time Grammy Winner Pat Benatar and Neil Giraldo and wrapping up with the Fat Tuesday networking reception. The Panel on Trial Skills with hall-of-famers Lisa Blue on Voir Dire, Tom Girardi on Opening Statement, Chris Searcy on Direct Examination, Mike Papantonio on Cross Examination and Mark Geragos on Summation. There will be a Q&A with the audience. A book signing with legal legend Alan Dershowitz. The Summit is the conference to attend for 2016. Further information is available at (866) 665-2852 and online.